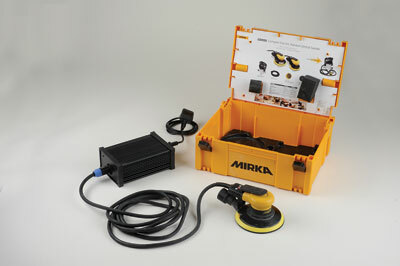 We first drew your attention to Mirka's Ceros range of random orbital sanders back in December 2011 and only recently managed to get our hands on a demo kit. 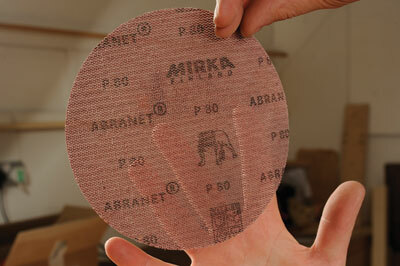 The likelihood is that you are familiar with Mirka abrasives but perhaps not their machines. As far as power tools go the name is associated with a comprehensive range of pneumatic tools aimed at professionals and in particular the automotive market. Air-tools have proven to be the best option for use in such demanding environments partly due to safety, convenience and longevity of service but the concept has failed to catch on in woodworking circles. 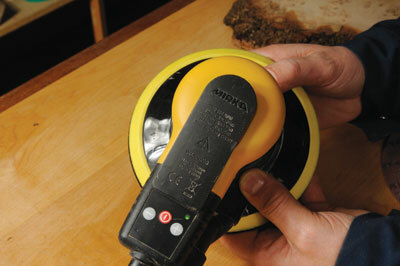 With the Ceros - compact electric random orbital sander - Mirka is reaching out to a new army of customers with some of the benefits that pneumatic tools have been delivering for decades. What first attracted me to the Ceros, however, was the size; it's very compact compared to other sanders. Single handed use is comfortable and affords a real sense of control compared to what now feels like an unnecessary amount of bulk on other machines. At 920g the unit is comparatively lightweight compared to similarly rated sanders in its class and the rubber coated, low profile body is really pleasant to hold. The real benefit of this can actually be found outside the workshop, because the Ceros is ideally suited to site work where the need for sanding a variety of surfaces can often prove awkward; think walls, skirtings and ceilings for starters. At the heart of the machine is a 22V DC 400W brushless motor driven by an external transformer that accepts either a 110 or 240V AC supply. The result is a machine that produces significantly less noise than the extraction unit it is attached to. The Ceros is available as either a 125 or 150mm unit with the choice of 2.5 or 5mm orbit. Variations in operating speed from 4,000 to 10,000rpm are adjustable in increments of 1,000 via +- switches located behind the trigger bar. Fully depressing the bar will cause the machine to operate at the maximum speed set. Alternatively, control can be diverted to the trigger bar by simultaneously pressing both +- buttons. The trigger bar is a little sensitive in this mode but some users may well benefit from this feature. An on/off button prevents any accidental start-ups. 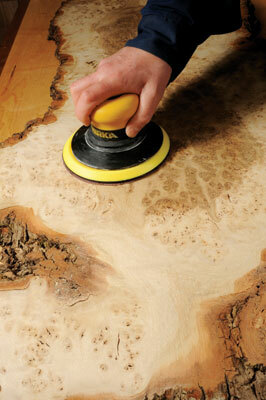 Mirka's Abranet system is without doubt the most efficient way of removing dust at source for both power and hand sanding. 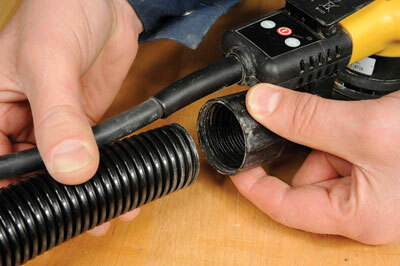 A 28mm dia swivel exhaust screws onto the hose making an airtight seal. New users often over-sand as there is little evidence of material being removed thanks to the efficiency of the system. In a typical 150mm abrasive disc there are around 1,000 holes for dust to escape and, though more expensive, they last a great deal longer than standard sheet abrasives. I tucked into a board of rough sawn burr oak, still with the bark on, with an 80 grit disc and found hardly a trace of dust on the board or bench-top. Working up through the grits achieved great results on bare timber but the sheets tend to be coarser than the regular abrasive equivalent. It's certainly not a problem as long as you work to the next grade up than what you might be used to. 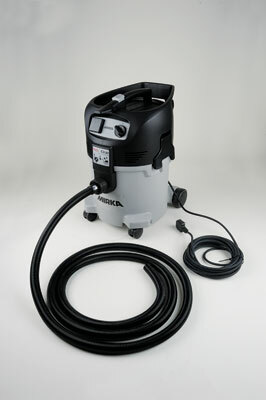 Mirka supplied us with their 30 litre capacity 915 vacuum machine. It features an electrical feed for automatic switching from a second device. The top is flat and a convenient location for the transformer although from the instruction book it appears a separate bracket is also available. 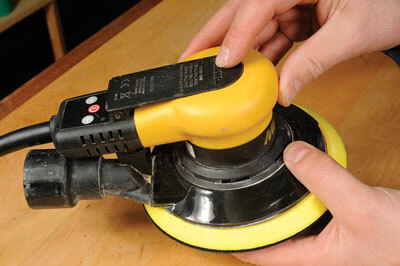 The suction rate can be adjusted but I'm not quite sure when and where this would come in handy. There's over 7m of cable on this machine, so plenty to get you to where you need to be and Mirka have a good range of cleaning up accessories to go with it. They also produce a pneumatic trigger system so it can be run automatically with air tool variants. As a complete system the Ceros has all the bases covered and is certainly built to last, so first of all do not let the size lead you into thinking it is not up to the job. There are a number of disc and pad configurations to get the machine set up for practically any operation. In many respects it outperforms most of the competition but there is noticeably more vibration present than on other bulkier machines we have tested in the last 12 months. In the general scheme of things this would go largely undetected but Mafell and Bosch have both produced sanders that have significantly reduced the levels of vibration transmitted to the operator. On price the Ceros is somewhere between the two and represents good value.